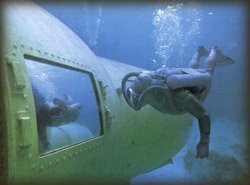 Living the life of an aquanaut is terribly exciting and unique. There are no land-side analogs that I know of. The aquanaut lives in a fixed structure beneath the surface of the ocean. He is not connected by a tunnel or an elevator. He is independent of the land and air above. He is a creature of the undersea region that is much more vast and expansive than those who are confined to the land areas. The undersea world covers not only four times more area squared but it is also measured in three dimensions, the aquanaut is not limited by the restrictive two dimensions of the land dweller. When the aquanaut leaves his dwelling, he can literally “fly” about his world as the land dwellers can only dream about. Each weekend (unless Claudia and I are traveling), QuantumLimit features an in depth article on the science and exploration issue du jour. In QuantumLimit today I am going to begin a multi-part discussion on what it is like to spend one day as an aquanaut. It is accessible by clicking here or on the button to the right.